Front Row, left to right: Elly Gilmore, Julia Merchant, Ann Lloyd, Cal Lloyd. Back Row, left to right: Matt Miller, Marcille Wallis, Don Pigeon, Brendan Nolan. Americans of Scottish descent played a major role in the development of the United States, and their influence continues to be felt in all aspects of American life, from politics to music to scientific ingenuity. 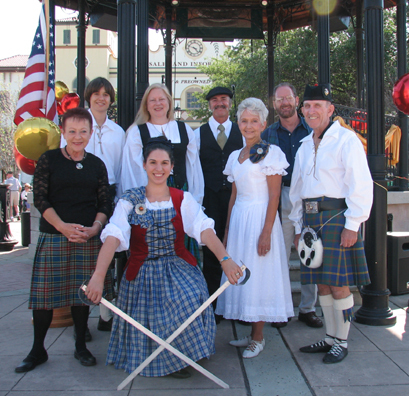 The United States Senate officially recognized the enormous contributions made by Scottish-Americans with the 1998 declaration of April 6 as Tartan Day, with the House Of Representatives following suit in 2005. From an humble beginning in a small Florida coffee café to a grand ballroom setting for The Memphis Scottish society to the exquisite Charlotte Performing Arts Center, Celtic Heritage Productions has developed a Rabbie Burns concert now entitled My Heart's in The Highlands. Affectionately known as The Haggis Bash, this two hour event comes complete with song, dance, poetry and guest of honor ... The Haggis!! By popular demand, Celtic Heritage Productions is pleased to offer a concert celebrating the traditional music and dance of Scotland, from the Lowlands to the Highlands and Islands.